The only escape valve was a collapse in the lira. And in the last few weeks, the currency has depreciated exponentially. 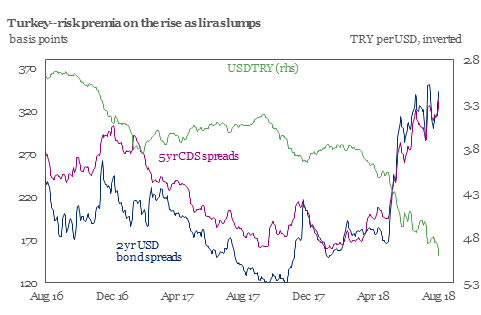 And fear that Turkish banks and corporations will not be able to pay their debts and the economy will suffer a meltdown has driven up the cost of its bonds and insuring against default (CDS). Turkey’s CDS spread and bond spreads have risen nearly 350 basis points—the highest level seen since the peak of the Euro area debt crisis. Higher refinancing costs will put further strain on government budgets and corporate borrowers. 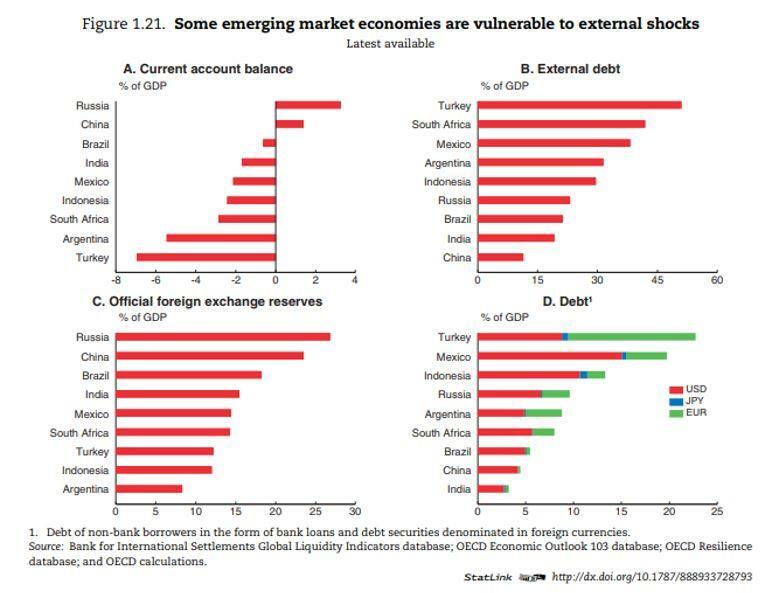 But Turkey is just the most extreme example of the growing debt crisis beginning to hit economies that depend on foreign capital flows and investment in order to grow (and that’s most). I have raised this prospect of an emerging economy debt crisis in previous posts, most recently with the fall of the Argentine peso. A strong dollar (the main currency of loans), rising interest rates (with the Fed and now the Bank of England hiking policy rates) and higher oil prices for those that must import energy (eg Argentina, Turkey, Ukraine, South Africa etc): are the factors triggering this impending crisis – not seen since the Asian/EM crisis of 1998. According to the IIF, the international research body of major multi-national banks, global debt (including financial sector debt) has reached $247trn, nearly 250% of world GDP. That would mean world debt grew something like 13% in the three years ended 2017. The global financial crash of 2008-9, ten years ago, did not lead to a total collapse of capitalism, even though it triggered the worst slump in investment and production since the 1930s. The financial sector was bailed out by huge injections of credit and cash and the capitalist sector was supported by zero or even negative interest rate policy by the central banks and unprecedented levels of money ‘printing’, called quantitative easing. The result was not much of an expansion in investment or production. In the major capitalist economies, economic growth (real GDP growth) has averaged no more than 2% a year (slightly more in the US and less elsewhere). In the so-called emerging economies, average growth rates also fell back. But above all, debt in all sectors rose. The result was inflated financial asset prices without the kind of “recovery” seen in previous ‘business cycles’. Just a decade after the Great Recession, the average US non-financial business went from 3.4x leverage (debt to earnings) to 4.1x. They are now roughly 20% more leveraged than they were the last time all hell broke loose. While Trump boasts of 4% growth and the US corporate sector never having it so good, the level of corporate debt in the US, alongside rising interest rates, is setting the scene for a new debt crisis. How will such a crisis emerge? 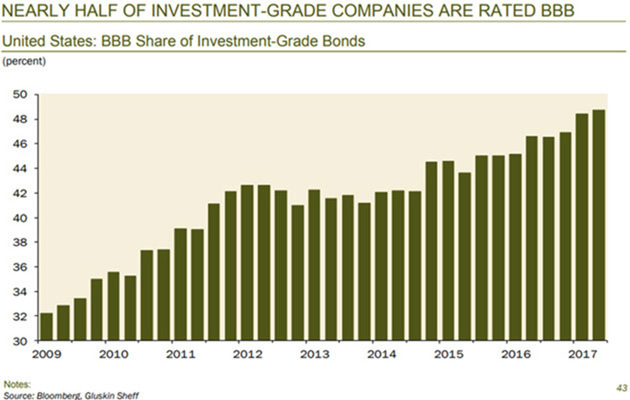 In the next year, US companies must refinance about $4trn of bonds, almost all of it at higher interest rates. This will hit debt-burdened companies that are already struggling and make it almost impossible for some to keep operating. Lenders, i.e. high-yield bond holders, will try to exit their positions all at once only to find a severe shortage of willing buyers. 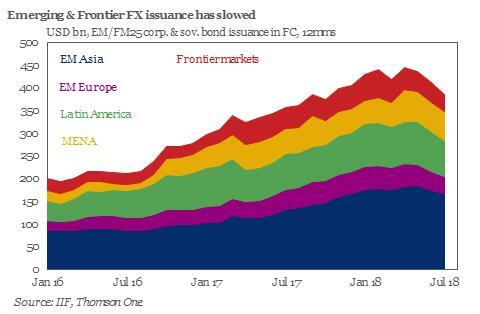 Something, possibly high-yield bonds, will set off a liquidity scramble. According to UNCTAD, “projections for global FDI in 2018 show fragile growth”. 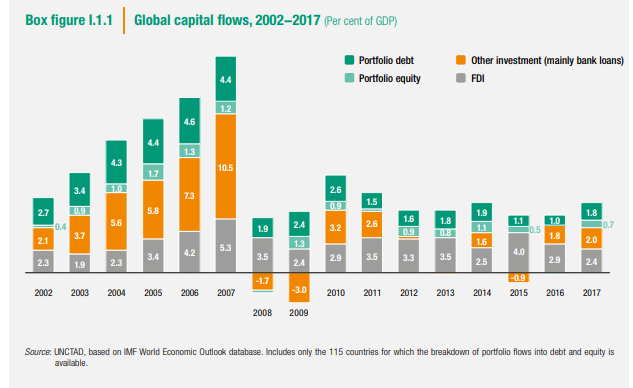 Global flows are forecast to increase marginally, by up to 10%, but remain well below the average over the past ten years. 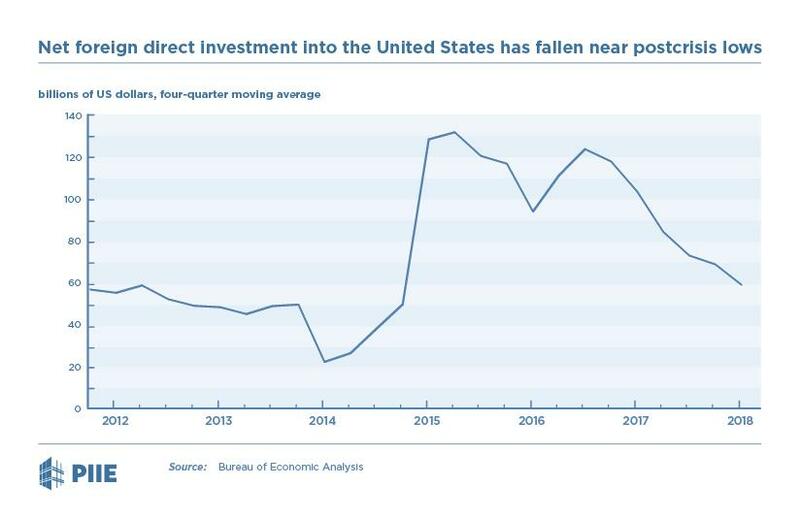 Multi-national companies are cutting back on international investment, partly because of the risk of a future trade war after Trump’s protectionist measures; and partly because possible debt crises in the most vulnerable ‘emerging’ economies. But a key reason is a fall in profitability from overseas investment. UNCTAD found that the global average return on foreign investment is now at 6.7%, down from 8.1% in 2012. Return on investment is in decline across all regions, with the sharpest drops in Africa, Latin America and the Caribbean. As a result, the rate of expansion of international production is slowing down. Assets and employees are increasing at a slower rate. Growth in the global value chain (GVC) has stagnated. Foreign investor profit in global trade peaked in 2010–2012 after two decades of continuous increases. 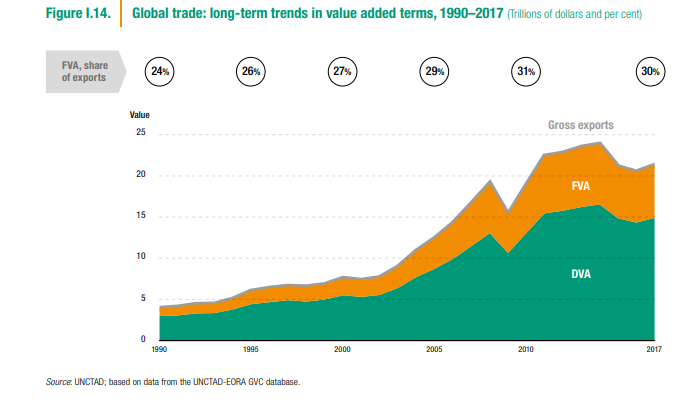 UNCTAD’s GVC data show foreign value added down 1 percentage point to 30% of trade in 2017. It’s not just as profitable to trade or invest globally compared to before the Great Recession. This entry was posted on August 3, 2018 at 8:09 am and is filed under capitalism, economics, Profitability. You can follow any responses to this entry through the RSS 2.0 feed. You can leave a response, or trackback from your own site. But this is combined and uneven. Some corporations have huge cash piles sitting on their balance sheets, some have expanded them further by using high bond prices to be able to borrow at centuries low rates. We have in developed economies, tens of thousands of zombie companies that will go under as interest rates rise, let alone as wages rise. So, we are set for a massive period of renewed concentration and centralisation of capital. The bondholders, and shareholders in many of those zombie companies will lose their shirts, as will those in those global companies with high levels of unsustainable debt, but anyone sitting on cash, including all those huge corporations like Apple, Microsoft et al, will be able to fill their boots. They will be able on the one hand, to pick up a load of distressed financial assets, and property for 10 cents on the dollar, and on the other, they will be able to pick up at once in a life time low prices the physical assets of any companies pulled down by their debts. That usually presages a period of very rapid expansion and capital accumulation, as Marx describes in Capital, because these newly acquired, cheap assets provide the basis of a sharp rise in the rate of profit. You seem to be predicting both a depression (though you don’t call it so):”…10’s of thousands of [trivialized] zombi companies [and their unmentioned millions of employees] and a boom:”…very rapid expansion and capital accumulation, as Marx [not so gleefully] describes in Capital”–as if each were happening at the same time! as if the one were merely a disembodied mathematical function of the other. But millions of actual beings dumped among growing, precariously employed low wage gig economy workers is more likely to lead to falling than to “rising wages” for workers in general, especially during the (inflationary) boom (presaged by the zombi-fest among the winning, labor and capitalist shedding capitalists). What you describe is late capitalism’s processes of destructive production, not the productive destruction of earlier industrial capitalism that Marx described with ironic ambiguity and even contempt. Happening. The trigger for a financial crash this time will be ETF funds which blindly follow the market. By the very nature of their algorithms they follow rising markets adding to their rise, just as they will drive down falling markets once the fall is established. They are as large if not larger than the sub-prime market in 2008. OK, remember this prediction over the next year or so.